Dr. Harvey’s work has focused on neurocognition, functional outcomes, aging and their relationships. The current focus on disability reduction in schizophrenia, including pharmacological treatments and cognitive remediation, has in large part originated from his work. Dr. Harvey has contributed to several federally funded initiatives aimed at the improvement of functional outcomes assessment in treatment studies, including MATRICS. He is the principal investigator of the newly-initiated Social Cognition Psychometric Evaluation (SCOPE) project, aimed at improving the assessments of social cognition in treatment studies. Dr. Harvey is also the principal investigator of a study that will use performance-based assessments of functional capacity (the capacity to perform everyday living skills) in comparing veterans with severe mental illness to healthy veterans. It is the largest Veterans Administration study ever in mental health research. 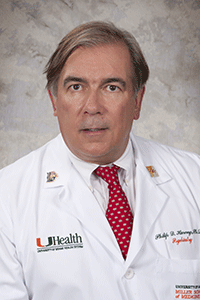 Dr. Harvey has formerly held positions at Emory University, the Atlanta Veterans Administration Medical Center and Mount Sinai School of Medicine.